Queenstown will host its first ice hockey international when the Ice Blacks go head-to-head with arch rivals Australia on Thursday. You could say the Winter Games brings the Ice Blacks a source of luck, as their only ever win against Australia was in Dunedin during the 2009 games. Ice hockey had since been taken off the Winter Games schedule as it made little sense to play matches so far form the hub of Queenstown, but the sport has been reintroduced now that the resort town has a facility up to international standards. Ice Blacks head coach Maru Rout, who played nine years for the Kiwis, expects the first match in the three-test series to be one of high intensity and close scoring. He believes having a large squad for the quick-fire series, which will be demanding on the players’ fitness, is crucial. “There will be a certain level of physicality, but we like to see good hockey and good goals because that is what’s going to win us games. There will be argy-bargy for sure, but we aren’t going to see fights out there on the ice,” Rout said. The Ice Blacks will feature long time captain and local Southern Stampede hero Bert Haines, Ice Blacks goal-scoring ace Andrew Cox, Dunedin Thunder’s Paris Heyd, Stampede’s Mitchell Frear, Canterbury’s Chris Eaden, and newly minted squad member Matthew Schneider, a standout defender for the Stampede the past season. 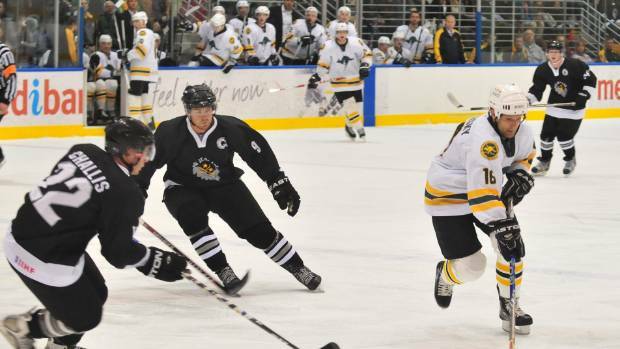 Rout said while Australia are ranked higher and have a stronger national ice hockey league, the Ice Blacks have improved over the past ten years and can compete with their trans-Tasman rivals. The Ice Blacks copped a 52-0 spanking from the Aussies 30 years ago, while last year’s four-goal defeat at the world championships was an indication the gulf between the sides had significantly been bridged. Games two and three are on Friday night and Saturday night respectively, with the puck dropping at 7pm for all three. Rout is expecting sellout crowds for all three matches.